The monthly Port Tracker report for July was released this week from NRF and its research partner Hackett Associates, and while the headline news was that container volume is slowing, up just 1% in May over 2010 levels and indicative of a still tepid and perhaps weakening US economy, we thought it would be a good opportunity to take a broad look at trends and news from US ports. The PierPass fee for truck access to the ports increased by 20% to $60 per TEU on 4th July. In the future, the traffic mitigation fee will be adjusted annually based on Pacific Maritime Association costs. According to Port Tracker, overall import container volumes decreased .6% in May at West coast ports, (the most recent month for which data is available) versus the prior year, versus an increase of 2.7% at East coast ports. Gulf coast port Houston, however, saw TEU volumes increase 7.3% year over year. On the other hand, ports in Tacoma and Seattle, the worst performers, saw double digit declines of 15.2% and 27.8%, respectively, versus 2010. For all of Q2 ending in June, Port Tracker believes container volumes will continue to be weak, growing just .4% for West coast ports and 3.9% on the East coast. For the year, Port Tracker estimates that total container volumes at the 12 North American ports it tracks (LA/Long Beach, Tacoma, Houston, Oakland, Seattle, Vancouver, Prince Rupert, Montreal, New York/New Jersey, Norfolk/Hampton Roads, Charleston, and Savannah) will rise 6.4% for all of 2011. Much of that is projected to come from big gains in Q4, with increases projected for West coast ports of 14.5% and 9.7% in East coast ports. West coast numbers were very weak in Q4 2010, making this year's projections strong by comparison. 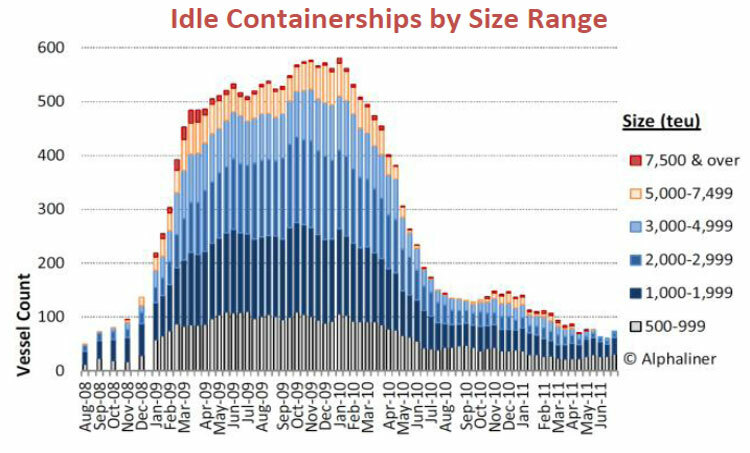 As another sign of the currently soft ocean shipper market, Port Tracker republishes a chart from the researchers at Alphaliner that shows a tick up in July in the amount of idled ocean shipping capacity. 74 ships with a capacity of 95,000 TEUs were listed as idle (see graphic below), an increase of 20,000 TEU in just two weeks. However, the idled capacity is coming exclusively from smaller ships, with no vessels with capacity of more than 5000 TEUs being put to dock. The Port Tracker report summarizes news connected to each of the 12 North American ports it follows, and we pulled out the most interesting bits of news for each port for the month. Los Angeles/Long Beach: The PierPass fee for truck access to the ports increased by 20% to $60 per TEU on 4th July. In the future, the traffic mitigation fee will be adjusted annually based on Pacific Maritime Association costs. The Port of Los Angeles saw a 15.6% increase in imports in May, while Long Beach gained 1.8%. Oakland: The commission just approved a capital budget for $85.6 million for 2011/12, and includes $29 million in maritime projects such as shore power infrastructure, dredging and security enhancements. An additional $40 million of projects is anticipated to be brought to the board for consideration during FY2012. Annual growth of around 5% is projected for 2011. Tacoma: Year-on-year declines are projected in Q2 and Q3, followed by single-digit increases in Q4 2011 and Q1 2012. A decline of approximately 2% is forecast in 2011 over 2010,with a total of 466,000 TEUs. Seattle: Late June saw the 800th vessel to use low-sulfur fuel while in port as part of the At-Berth Clean Fuels program. The program is estimated to have stopped the release of nearly 500 metric tons of sulfur dioxide since it began in 2009. The port provides an average incentive of $2,250 to use low sulfur fuel in vessels’ auxiliary engines for each call. Total volumes in 2011 are forecast to fall slightly below those of 2010. Vancouver: The port’s partnerships with CP and CN have helped to decrease container dwell times at the port by almost a third over the past year, to consistently fewer than three days. The second half of 2011 is projected to post a 16.9% increase over the first half of the year, with records volume levels anticipated in Q3. Prince Rupert: The port enjoyed a third straight month of double-digit percentage growth in May. The 2,000 TEU increase to 17,000 TEUs equates to a 19.2% month-on-month gain and a 10.3% year-on-year gain. The total volume forecast for 2011 is 246,000 TEUs, which would represent an almost 27% gain on 2010. This would equate to a 52,000 TEU increase. Montreal: The total volume forecast for 2011 is 583,000 TEUs, which would represent an 8.7% gain on 2010. New York/New Jersey: The board of the Port Authority of New York and New Jersey approved a restructured lease with the Port Newark Container Terminal that will provide $500 million in private capital investment to upgrade the existing facility. The second half of 2011 is projected to post an 8.8% increase over the first half of the year. The total volume imported in 2011 is estimated to increase by 6% over 2010’s volume. Norfolk/Hampton Roads: Virginia Governor Bob McDonnell signed legislation designed to encourage growth at the Port of Virginia by providing tax incentives for certain port users. Two of the bills provide tax credits for manufacturing companies that increase cargo volumes through the port or create import/export related jobs with at least a 10% increase in cargo. The third bill grants a $50 per container income tax credit for any company shipping cargo containers via barge or rail. The total volume imported in 2011 is estimated to increase by almost 5% over 2010. Charleston: The South Carolina State Ports Authority (SCSPA) Board approved a FY2012 budget with nearly $82 million in capital projects. The largest areas of planned spending are terminal infrastructure improvements and a new cruise terminal, as well as nearly $17 million allocated towards the new terminal operating system. Total imports in 2011 are forecast to be approximately 600,000 TEUs, which would equate to a 7% increase over 2010. Savannah: The second half of 2011 is forecast to post a 20.7% increase over the first half of the year. Total imports in 2011 are forecast to be approximately 1.16 million TEUs, which would equate to around a 10% increase over 2010. Houston: The second half of 2011 is projected to post a 17.9% increase over the first half of the year. A total of 550,000 TEUs are forecast to be imported in 2011, for a 15% year-on-year gain. Are your observations on port traffic and trends consistent with the Port Tracker report? Let us know your thoughts at the Feedback button below.